My name's Collin, and I'm from northeast Indiana. I recently got done with suspension, steering, brake, etc. stuff on my 1987 RX-7 na. It runs fine, but I just bought another 13b 6 port to rebuild. I'm aiming for around 250whp, so I'll need to be plenty creative. I'll share my little experience with S4 stuff where needed, and I'm excited to learn from all you who know tons more than I know. Thanks for the compliment! I love FC's, too. Nice ride and welcome to the forum! Please keep us informed on your progress. Thanks! As soon as I delve in the engine, things should progress again. Nice are you rebuilding it yourself.? 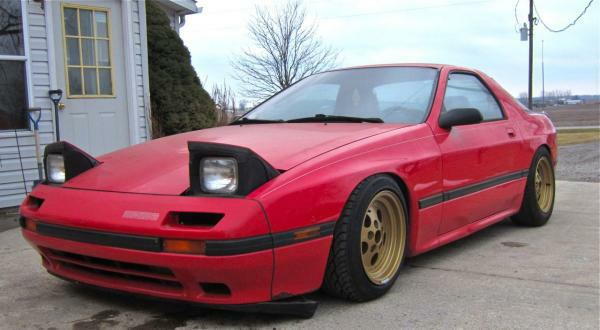 sweet fc man.... i have a 88 gtu and live in the same state. i dont know anyone the has a rx7 around here so if you know of any shows this summer i would like to know about them. The way your car sits is basically perfect! What are they? Awesome! I'm up near Ft. Wayne, and I'm just getting into shows and events myself! Try the Midwest RX-7 Forum on this site to find out the groups in Indy. I'm sure there's a bunch. Thanks for the compliments! The wheels are 15x8 Jeep Gamblers sandblasted and powdercoated metallic gold with a satin clear. Those wheels are 25.4 offset with 3/4 in. wheel spacers to clear the front four piston calipers. It's around 6.5ish offset. 195/55 fronts, 205/60 rears. The rear wheels are over -3 degrees camber which isn't my thing, but it works for now. Hi, My name is Tony Conti and I am a new member. I do not know if I am actually replying to you. However, I have an '82 RX-7 in beautiful shape with only 69,900 original miles on the car. Can you give me any direction on how to sell the car through the RX-7 club in Indiana----I am from Fort Wayne. Thanks!